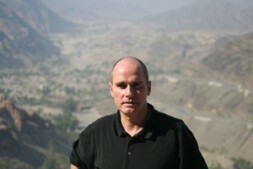 Dr. Hubertus Hoffmann, President of the independent World Security Network Foundation near the border of Pakistan and Afghanistan at the Khyber Pass in the tribal areas: "Germany and the other NATO states require a new and comprehensive NATO Double-Track Decision for Afghanistan and Pakistan, a genuine equality and balance between military and civilian efforts comprising two columns of a total strategy in financing, structure and definition of priorities, departing from a fixation on military-based peacekeeping." Germany requires a new and comprehensive NATO Double-Track Decision for Afghanistan and Pakistan, analogous to the successful approach of NATO's Harmel Report of 1967 (defensive capability plus détente) and the NATO Double-Track Decision of 1979 conceived by Chancellor Helmut Schmidt. During a difficult phase in German foreign policy it was this strategy, which made the impossible possible, namely the dismantling of hundreds of Soviet SS-20 nuclear missiles and the maintenance of credible deterrence. The German Social Democratic Party (SPD) should reconcile itself with its much-merited former Chancellor. In his spirit and that of classic SPD security policy since Godesberg, a new NATO Double-Track Decision for Afghanistan, which extends beyond party lines, should be formulated and passed. This must place the far too militaristic discussion in the Alliance, following eight hardly successful years, on two columns: military and détente, power and diplomacy, hard and soft factors of peacemaking, security and reconstruction including a close involvement of Pakistan. Upon the initiative of the German government (due to reasons of urgency), this new NATO Double-Track Decision for Afghanistan and Pakistan should be passed in the North Atlantic Alliance in a few months so that the Alliance turns its focus away from the to-date military aspect and the provision of increased numbers of troops towards the big picture. The SPD parliamentary group in the German Bundestag should, in addition, bring forward a parliamentary motion across party lines to produce an Annual Report of the German Government on Afghanistan and Pakistan. This written report containing numerous details should be presented to the Parliament and discussed thoroughly. (This worked marvelously with the Annual Report of the German Government on Arms Control, initiated by me in 1980.) The members of Parliament and the general public have a right to be informed regularly from a single source and in detail from all involved department as well as the Chancellery as to what extent the military and civilian efforts in Afghanistan and Pakistan have progressed. The first report should be published prior to the summer break. - A genuine equality and balance between military and civilian efforts comprising two columns of a total strategy in financing, structure and definition of priorities, departing from a fixation on military-based peacekeeping. - The integration of all national and international developmental aid programs for Afghanistan and Pakistan in this strategy, as only then can an effective and strong second column of peacekeeping come into existence. - Priority for all programs showing quick results for the people locally in the coming 24 months, because we require rapid success on the ground. A regrouping in favor of immediate measures, such as local employment programs for millions of unemployed youths and their enlistment in the Afghan armed forces. - Clear monitoring of success and quarterly examination of the implementation of all programs locally, departing from vague commitments and fantastic pronouncements to locally effective measures conceived according to the best examples from the region. - Clear written requirements for rapid, timely implementation and the time available, as well as a clear definition of responsibility when programs become bogged down. - The foundation of our policies must be what the people want locally, not what we in the West see for Afghanistan and Pakistan. We need a new thought and solution approach from the bottom up, and no perception of our designs in the hearts and minds of Afghans. - The assistance for the people living in the war zone is active international solidarity, also in the sense of traditional Social Democratic foreign policy. All of us in the West bear considerable responsibility for these people, the majority of whom desire peace, jobs, education and development (as do we) and who have suffered more than 30 years of war. - No more focusing on the central government in Kabul, instead attention to a number of small priorities in the regions of the nation and direct support of effective regional programs rather than the ineffective and often corrupt paths via the central government in Kabul. Clear revealing of corruption and mismanagement, also within the central government, without taboos and the cessation of support for corrupt ministers and politicians. - The integration in the peace process of active fighters from diverse Taliban groups is decisive for NATO's success, and must therefore become a new priority both financially and politically. To date, the central government in Kabul has blocked the enlistment of many hundreds of thousands of men in the Afghan army and local militias, which could be effectively supported by NATO and who otherwise would be won over by the Taliban. - Beginning of official UN peace negotiations with the Taliban with the goal of a larger, long-term solution, without adding any preconditions combined with an immediate ceasefire. In the preliminary negotiations, the Taliban must cut off its connections to Al Qaeda, as well as recognize the UN's Universal Declaration of Human Rights including education for women and the peace commandment of the Koran. Germany could take on a key role as a fair broker, due to its excellent reputation in Pakistan and credibility in Afghanistan and the Arab world. - Taliban leader Mullah Omar should be offered exile in Saudi Arabia, and Afghan President Karzai should be offered exile in France as a means of facilitating a new beginning. - In spite of numerous mistakes, Karzai has rendered valuable services; however, after eight difficult years, he should retire and make way for an unblemished, credible government, which through elections by year's end would signal a genuine new beginning. - An annual reduction in opium production in Afghanistan of 20 percent, as no drug nation is worth the life of a single German soldier. Purchases of the opium production of 7,000 tons annually for approx. $700 million - as practiced successfully in Turkey in the 1970s - for utilization as the raw material for medical purposes. - A new emphasis of German developmental aid policy should be in the particularly important tribal areas (FATA) in Pakistan, close to the border to Afghanistan, because these areas are significant for Al Qaeda and the Taliban. From here, Afghanistan and Pakistan are attacked and terrorists are trained for missions in Germany. The Ministry for Development should now provide €100 million annually for this key region for education, employment programs and radio stations. It should also rapidly support the various suggested projects. - Germany must urge the continuation of a policy of détente for Kashmir in India which, following the terrorist attacks in Mumbai have been practically frozen by the Indian side, and promote an international Kashmir conference. This conflict hinders the necessary focus of Pakistani armed forces on the threats in Afghanistan and in the tribal areas. These theses are dedicated to the memory of two outstanding Social Democrats: Hans Janitschek founding Vice President of the World Security Network Foundation in New York, 1969-1977 General Secretary of Socialist International in London; and longtime member of the German Bundestag Horst Niggemeier who, together with the author initiated in 1978 the "Dattelner Appeal", which for the first time envisioned a zero-option for intermediate range missiles supported by more than 100 representatives including German Bundestag President Annemarie Renger (SPD) and U.S. Senator Edward Kennedy. The global, independent and cross-party World Security Network Foundation - with an Advisory Board in which 17 former Generals are active, including former Chiefs of Staff of Great Britain, Germany, Pakistan and SHAPE and ex-Commanders of ISAF and KFOR as well as the U.S. chief negotiator of SALT II and the Indian Defense Minister - focus on new, balanced Double-Strategies based on hard and soft factors of peacekeeping. It is active in Pakistan (FATA). The proposals derive from various discussion forums, also in Pakistan, and represent the personal opinion of the author. Informations at: www.worldsecuritynetwork.com and www.codesoftolerance.com.